Meeting the chilled schedule implies the need to have high weaning weights, strong post weaning growth rates and exceptional growth rates from early August. Our approach is to provide pre-emptive inputs; applied to pasture for hinds and fawns, setting up post weaning pasture or specialist crops, drenched at weaning, applied to spring pasture, and using baleage /silage as a delivery vehicle for hinds over the autumn winter. COPPERCHARGE PLUS is a mineral trace element combination for spraying onto pasture (or crop) that will be grazed or made into silage/ baleage. 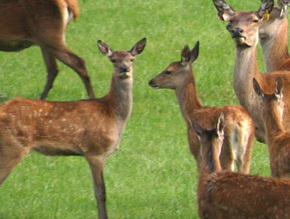 It is targeted for hinds and fawns during the lactation (summer and early autumn), weaners/ rising yearlings (autumn/winter/spring), hinds (spring). Results from our trials are in line with industry trials and demonstrate that spray application of copper is a viable alternative to copper bullet treatment. Weaning is undoubtedly a stressful time which increases the requirement for nutrients, especially vitamins, yet the supply from the rumen is typically reduced. Changing diets, especially when it is onto brassica crops, can give rumen microbes a setback – it takes time for them to transition and often vitamin production is impaired during this time. The impact of this is greatest when the two diets are contrasting in digestibility and effective fibre. Examples: summer dry to summer crop, or from high country pasture to crop. QUICKSHIFT is a drench designed for use at weaning or at the time of a feed change. CUVENAMIN is a trace element mix designed to be added to supplementary feed for a 30-90 day set up period. It can be added to silage (powder spread over load), gravity sprayed onto baleage as it is unrolled (20litre container, hose, plastic tap and watering can nozzles). It can also be added to the water supply (via trough dispenser / header tank), though there is potential for the water to become unpalatable if the deer are not drinking enough and product continues to be added. MAGNET 175 is a loose format free-access magnesium only product. On some properties hinds and weaners have taken to this. Where crops are used for summer / autumn feeding of hinds and fawns and or weaners, the palatability of those crops is of paramount importance. SCOFFERT is added to fertiliser and lime at crop establishment and completes the profile of fertiliser nutrients in order to maximise yield (yield response expected in inland areas), improve drymatter quality, increase palatability and with it the proportion of crop utilised by choice.